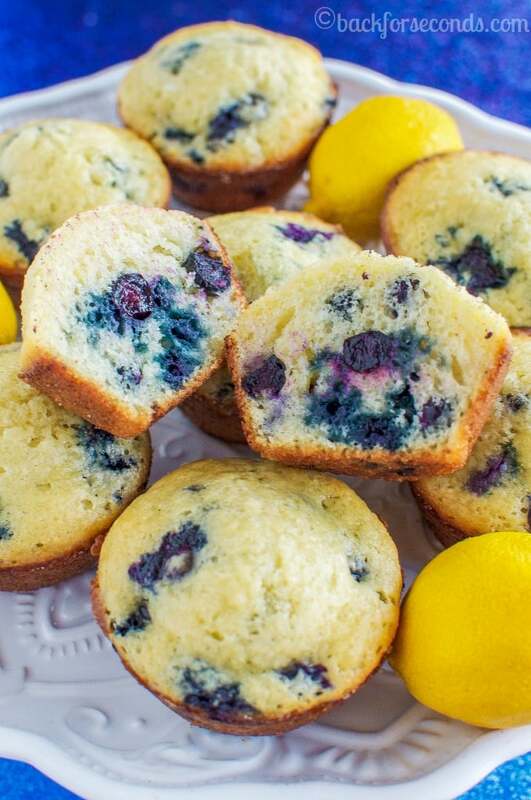 This recipe makes the best Lemon Blueberry Muffins! They are fluffy and moist with lots of vibrant lemon, juicy blueberries, and a crunchy sugar crust! No need to fork over your hard earned cash for some bakery Lemon Blueberry Muffins. They are so easy to make at home, and can be ready to eat in 30 minutes! There is nothing like warm, tender, bakery style Lemon Blueberry Muffins fresh from the oven! Lemons and blueberries pair so beautifully together. I like to bake with these flavors a lot in the summer when fresh blueberries are plentiful! I added quite a bit of lemon zest to these muffins because I really love the punch it gives, but feel free to use less if you want a more subtle lemon flavor. There is no need to line your muffin tins for this recipe. Just spray with non stick spray and add a sprinkling of granulated sugar. It keeps the muffins from sticking and adds a nice crunchy crust! Add some coarse sugar or sugar in the raw on the tops before baking for a true bakery style muffin! This recipe makes 24 muffins, but they freeze beautifully! Just set them on the counter to thaw or warm them in the microwave for a quick breakfast or snack! Enjoy! 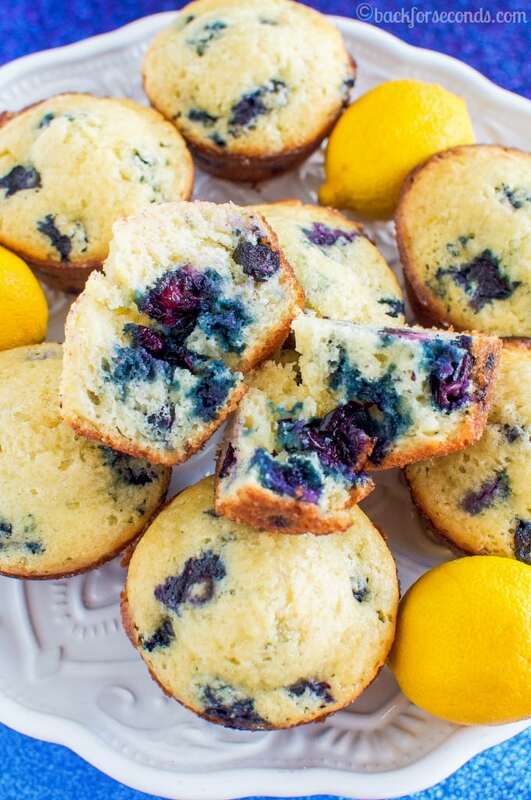 Lemon-blueberry is such a winning flavor combination and these muffins look perfect! I’d pick off the topping from all the muffins first! 😀 Yum! My daughter is a blueberry muffin fanatic – she could finish a batch in a matter of days (or less)… 😉 These look delicious! 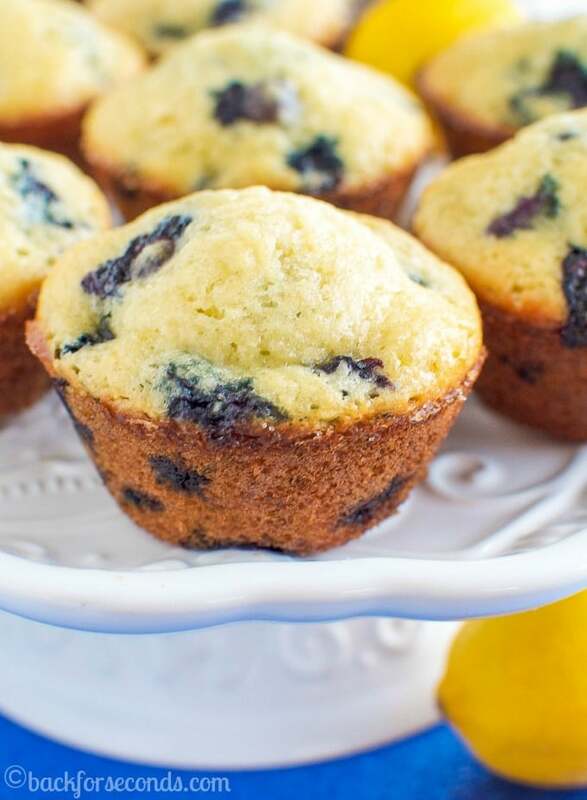 Lemon and blueberry is such a fantastic muffin combination! These would disappear in a day at my house. 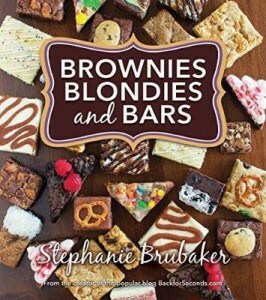 One of my favorite combinations…they were made for each other, Mmmmm! I want 2!